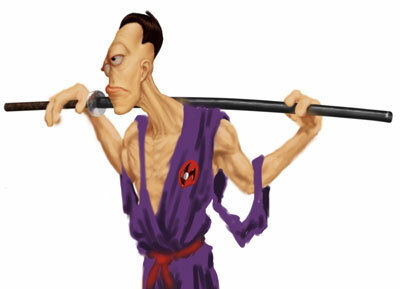 This guy is one of the evil samurai fighting against the 3ft ninja (in the digital section). I've just about finished his face, but I'm still trying various poses for his body-it's just roughed in now. I was working on this for a friend, but she got shelved, and I haven't worked on her in months. Again, her face is finished, and her body is about 75% finished, then I have a translucent shower curtain and tile wall to draw. The image will go down to about knee height.